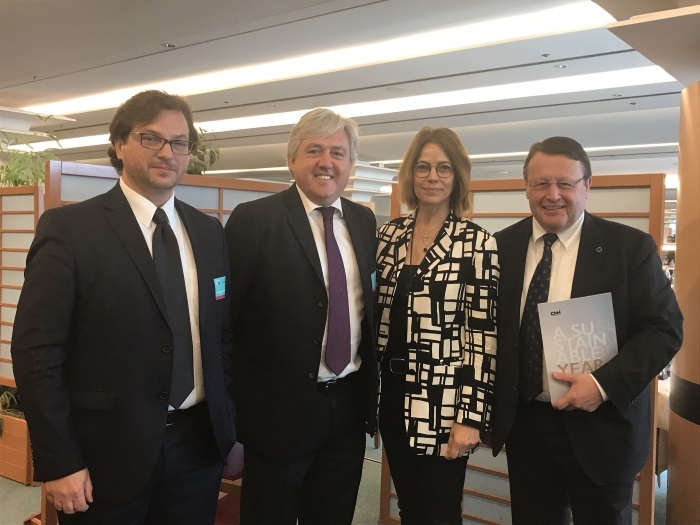 New Holland Agriculture was invited to present its vision on a new course for agricultural mechanisation to members of the European Parliament at a Working Breakfast held today in Brussels on “The Future of Sustainable Agriculture’. New Holland Agriculture Brand President Carlo Lambro and Antonio Marzia, Head of Data Analytics and Services, were invited by Paolo De Castro, Vice-Chair of the Committee on Agriculture and Rural Development, to present the brand’s vision on the future of farming at the Working Breakfast. In addition to Members of the European Parliament, attendees included representatives from academic, institutional and industrial fields. The meeting provided the opportunity to share with key decision-makers New Holland’s Clean Energy Leader strategy, which sets a new course for agricultural mechanisation focused on precision farming and renewable fuels. In his opening address, Paolo De Castro remarked that innovation is the main driver for sustainable intensification, which means producing more with fewer inputs. Agriculture has always been an ‘industry of constant innovation’, especially in the last decade. The CAP reform for 2014-2020 identifies innovation as an essential factor to prepare agriculture for future challenges. The closer link between innovation, productivity and sustainability becomes evident. The aim is then to improve competitiveness, the efficient management of resources and the environmental performance of the supply chains and economic system in rural areas. In other words, the system of knowledge and innovation becomes a strategic lever for agriculture and rural development. Carlo Lambro explained New Holland’s vision of sustainability, which is expressed in the brand’s Clean Energy Leader® strategy. One of its key pillars is Growing Energy, which has led the brand to pursue solutions using renewable alternative fuels such as biodiesel and methane. In its vision of an Energy Independent Farm, New Holland has taken the concept even further. Such a farm is able to meet its energy requirements by converting biomass obtained from crops and agricultural waste into biomethane and electric energy, creating a virtuous cycle. This vision, in turn, has led to the development of the Methane Power Tractor. In the context of an Energy Independent Farm the tractor can be powered by bio-methane produced by the farm, consequently operating with a virtually neutral carbon impact. Extensive field testing of prototype Methane Power Tractors are ongoing in Europe and in Brazil, and data collected to date have shown significant cost savings and lower emissions compared to standard Diesel tractors. Carlo Lambro also explained how New Holland saw early on the key role of Compressed Natural Gas (CNG) in achieving a low carbon future for agriculture, and has invested in technology for this fuel. He highlighted the fact that today CNG has the greatest potential to deliver on all fronts: performance, costs and sustainability. The development of CNG distribution infrastructure is needed in order to support the widespread adoption of this fuel in agriculture, where it is not possible to produce it on the farm. Precision Farming also plays a key role in achieving a sustainable future for agriculture, and is dramatically changing the landscape of farming. Carlo Lambro outlined New Holland’s advance in this field and spoke about its participation in the Internet of Food & Farm 2020 initiative born of the Alliance of Internet of Things Innovation established by the European Commission. Antonio Marzia presented New Holland’s Precision Land Management strategy and its role in achieving a sustainable agriculture through the reduction of fuel consumption – and consequently CO2 emission – and the use of less fertiliser, pesticides and water, and hence protecting the environment. He outlined the evolution of Precision Farming and the brand’s vision on what is coming in Agriculture 4.0 through connectivity to third party services where real time information is analysed and used immediately. This results in an Agricultural Ecosystem where smart technologies optimise the performance of the individual machine, efficient systems of connected machines manage specific agricultural processes. Machines communicate with each other and with the farm manager through an open data flow, the ecosystem is integrated by data flowing through the precision technologies and service providers. This means that decisions are based on facts and reaction times are much shorter. New Holland’s focus on continuously raising the level of efficiency and profitability that customers can achieve with its equipment has driven these advances – and will continue to do so. The brand’s overarching aim is to help create a sustainable future for agriculture and be a driving force in this important change.